Article first published as Blu-ray Review: 'The Flash - The Complete Third Season' on Blogcritics. The Flash – The Complete Third Season has arrived! The show’s junior year begins with Barry Allen having altered time to save his mother’s life. Unfortunately for Barry, that comes with a whole host of unforeseen consequences. Barry seeks to reverse the new timeline, dubbed Flashpoint, but despite his best efforts, things don’t exactly go back to normal. There are many consequences for him to deal with, testing the superhero in new and challenging ways. I like The Complete Third Season‘s premise a lot. Many shows and movies have dealt with time travel, but few have gotten into the realistic intricacies of it. The fact that Barry Allen, a.k.a. The Flash (Grant Gustin), changes something doesn’t meant it can easily be undone. In The Flash, time is portrayed as a fragile thing, and while much can be set back to the way it was, there will always be differences that cannot be undone. Barry learns his lesson early in the year not to screw with the past again, though he has to deal with the fallout from his actions for a long time to come. The character-driven story goes hand-in-hand with the neat science fiction element. The best superheroes aren’t perfect, and learn the hard way that their actions have consequences. Even if they do something with the noblest of intentions, the world doesn’t always let them off the hook. This is a very hard lesson to learn, but an authentic tale to tell. The weight of it gives a new angle to Barry that I enjoyed very much. Hanging over the whole season is another time-travel related problem: tossed briefly into the future, Barry sees Iris West (Candice Patton), the love of his life, perish at the hands of Savitar, the Big Bad this year. Obviously, Barry wants to change this future, and has a very hard time doing so. This opens up the dichotomy of time also being hard to change, and even after learning a lesson, there may be a desire to repeat the mistake. This complexity, combined with the above, makes for a very pleasing run of episodes. There are many other highlights in the twenty-three episode season. I loved the musical crossover episode with Supergirl, “Duet,” which made good use of the strong singing talents of both casts. Patton did an excellent job portraying an Iris that could accept her fate. Cisco’s (Carlos Valdes) flirty relationship with new frenemy Gypsy (Jessica Camacho, Sleepy Hollow) is fun, as is the inclusion of H.G., the third major character played by Tom Cavanagh in three seasons. Adding Julian Albert (Tom Felton, the Harry Potter films) to the cast nicely shook up the dynamic. A visit to Gorilla City made for a cool way to play up the different worlds The Flash deals with. And it is very hard not to be delighted by Caitlin’s turn as Killer Frost (Danielle Panabaker), evil as she may be. The Complete Third Season does expose a glaring problem with setting multiple television series in the same universe, though. Savitar is a truly terrible villain, and the possibility of losing Iris is just about the worst thing Barry can imagine. Yet, Barry doesn’t call upon the Green Arrow, Supergirl, or any of his other super-powered friends for help (save a one-episode appearance by Snart (Wentworth Miller)). Given how serious the situation is and how desperate he becomes, Barry should be making use of any avenue available to him, so it doesn’t make sense that he doesn’t recruit his pals from the other shows. The mid-season crossover event was OK, but there really should be more integration in a story with such intense stakes. The Flash – The Complete Third Season comes with a wealth of extras, including TEN featurettes! Unfortunately, one of them is the 2016 Comic-Con panel for the show, and as covered in other recent reviews, sticking it on the last disc of the set isn’t very helpful; we really need next year’s panel, or, at minimum, put it on the first disc to view before the episodes. But the other featurettes, covering a variety of topics, are good, and there are also deleted scenes and a gag reel. 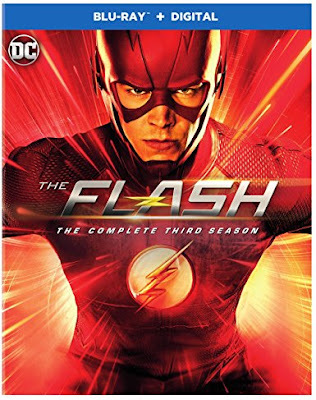 The Flash – The Complete Third Season is available now on Blu-ray, DVD, and digital.